Sweet cherries cooked with honey, balsamic vinegar and basil top these goat cheese crostini. Well, at last. After six months or so of exercising 5 to 6 times a week, I went to the Y in a mood a few days ago. I was conscious of wanting an aerobic workout. Wanting as opposed to dreading or grudgingly slogging. And when I finished my 30 minutes on the open-stride elliptical, I felt way better. This, I guess is how people get themselves to the gym after work — knowing it will make them feel better and anticipating that exercise. Not tired and achy and stressed but less of all those. It was amaze-balls. I’‘ve heard this experience described for years and years, usually when I was hauling myself to the gym and complaining all the way. “Oh, you’ll feel better as soon as you work out.” No, I’ll be even tired-er. This phenomenon probably happens more quickly if you’re under 72, but it has happened! I felt better. Restored even. It was worth waiting and working for — all those times I went to the Y when I didn’t feel like going. And that’s true of every aspect of fitness in your later (“perennial” as we’re calling them now) years. More work. More meaningful rewards. 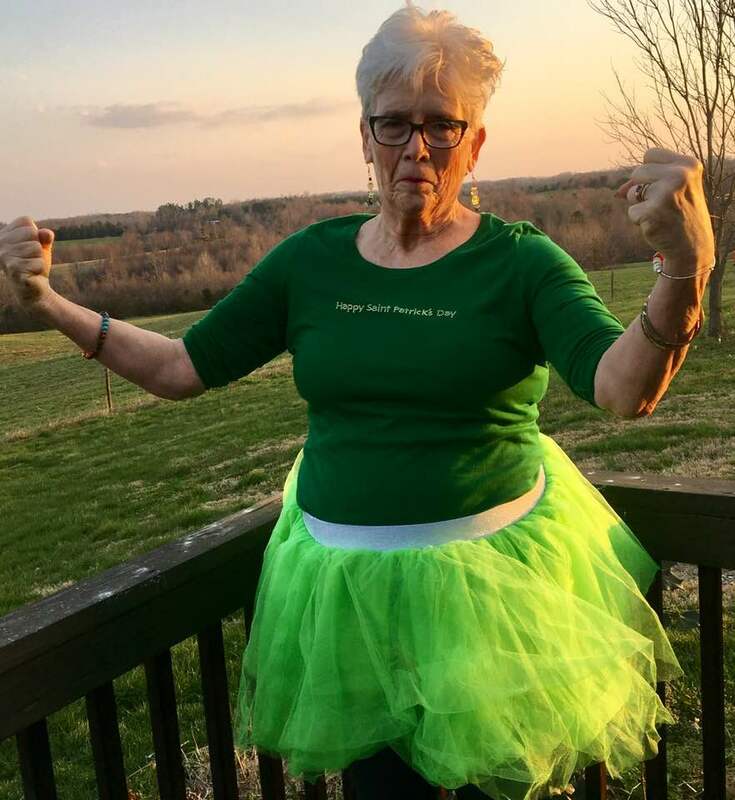 Just read on the Silver Sneakers instructors’ website about a 96-year-old woman who does three Silver Sneakers classes a week, two Spin classes and one weekly session with a personal trainer. I’m clearly not doing enough! That’s what I’m trying to impress upon my Silver Sneakers students, that they not only have to work at being fit but the older they get, the harder they must work to just maintain. Not pretty but it’s true. If you’re not pushing yourself, you’re probably not even holding at your current level of fitness, let alone increasing it. Went to Sprint (choreographed high-intensity interval training on a stationary bike) last weekend and not only made it through the 30 minutes without throwing up — I stood to pedal every time we were instructed to do so. I didn’t stay standing through every one of those intervals but I stood at least for a while. Likewise, I didn’t pump the pedals as fast as the instructor, but I’m working on it! That’s the key, I think — keep working. And to reward yourself, enjoy these crostini, adapted from a Barefoot Contessa recipe. They’re a lovely, different, not especially fattening appetizer or even a side to say, a bowl of homemade soup. Heat oven to 350°. Slice baguette into 1/2-inch slices and lay slices flat on large, rimmed baking pan. Brush with olive oil; sprinkle with salt and paper. Bake 8 to 10 minutes until crispy and golden. Cool on wire rack (cut up any leftovers for croutons in your salad). Chop cherries. Discard extra juice or use it to flavor your breakfast yogurt. Put cherries, honey, vinegar and an additional pinch of salt in saucepan and, stirring, bring to boil. Reduce heat and simmer for 5 minutes. Cool. Ready to teach St. Patrick’s Eve Silver Sneakers! I remember when we were afraid we’d develop muscles if we exercised in junior high. 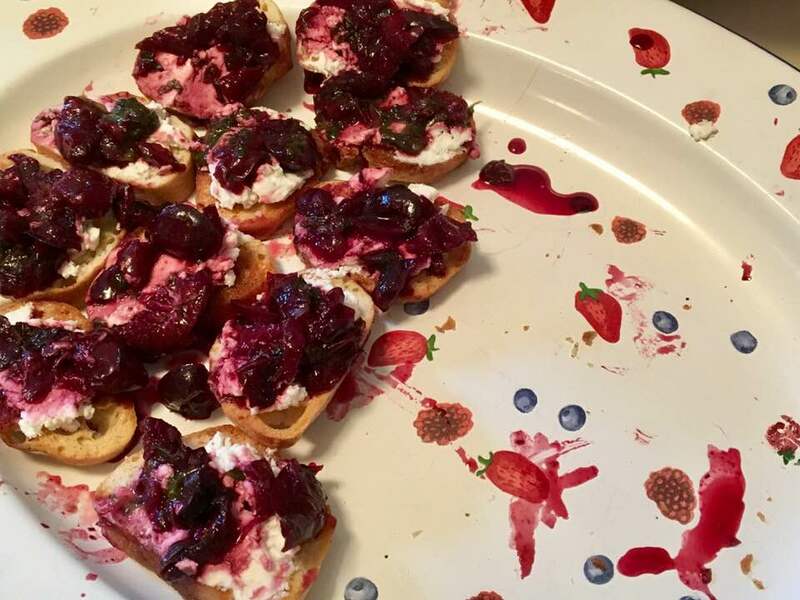 Spread smear of goat cheese, topped with a spoonful of cherry mixture. Sprinkle remaining basil over all and serve immediately. *You can use fresh rosemary for a very different taste. Good on you! And yummy looking recipe, thanks for sharing.